The episode opens with Rick (Andrew Lincoln) and Michonne (Danai Gurira) by Carl’s freshly covered grave. Michonne takes down walkers as Rick has a final moment next to his dead son’s grave. She then heads to Alexandria’s gate, kills more walkers, and eventually pulls the gate to a close even though Alexandria is deserted. Returning to their home, she finds Carl and Judith’s handprints on the porch and allows herself a very brief moment to be emotional. Inside, Rick loads up supplies. Together they pack up a van, but Michonne won’t let a structure Carl used to sit on burn. She grabs a fire extinguisher and Rick does the same. As they fight the fire, they’re surrounded by walkers. Fortunately, they kill their way back to the van. They couldn’t stop the structure from burning and are forced to leave Alexandria to the walkers. Rick wonders if Carl wanted them to stop fighting Negan and the Saviors. Michonne asks if Rick wants to read Carl’s letters, but he doesn’t…not yet. Michonne notices Carl wrote a letter to Negan, and Rick changes the subject and says he has to talk to Jadis. He thinks they’ll be a target of Negan’s now since they joined him to attack the Sanctuary. He believes they need Jadis’ people, the Scavengers (or the Heapsters, as Negan calls them), and their weapons. Michonne and Rick arrive at Jadis’ place and are immediately trapped inside. The Scavengers have been slaughtered and are now walkers, advancing on the trapped Michonne and Rick. Negan (Jeffrey Dean Morgan) tells his people the Hilltop is covered and he wants his people to find the Alexandrians. He realizes the Alexandrians had an escape plan and knows Carl played him. 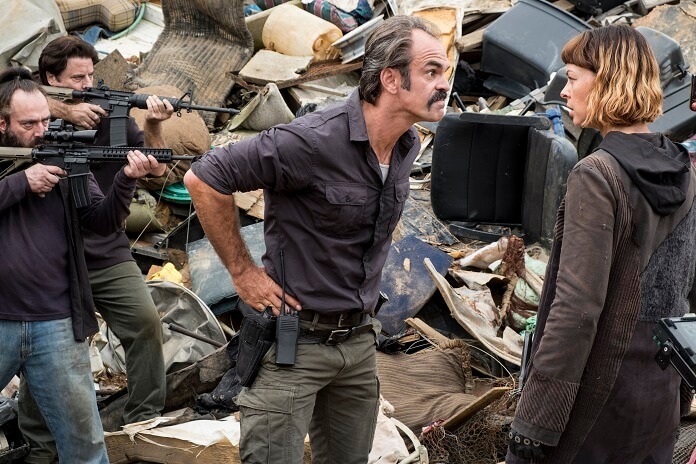 Simon (Steven Ogg) asks about Gavin, but Negan isn’t worried. (He should be!) Negan orders Simon to put aside his anger at the Heapsters. He’s only allowed to take one out – just one – and Negan believes the rest will fall in line. Simon, however, wants to kill them all. He doesn’t think the garbage rats understand what’s going on. He wants to wipe everyone out and move elsewhere. Negan’s increasingly angry at Simon for believing they should cut their losses and move on, and for questioning his orders. Negan is sure that after he kills Rick, everything will return to normal. Simon and Negan are interrupted by three Saviors delivering the coffin from Hilltop. Maggie’s message “We have 38 more. Stand down” is written across the top. Dean’s inside and he’s a walker, so Negan takes him out using a nail gun. Simon is even more certain they need to kill everyone at Hilltop at this point, thinking they can’t let Hilltop and the others get away with this. Negan yells, “You will do your job!” and stands by his command to keep everyone except for one person alive. Enid (Katelyn Nacon) and Aaron (Ross Marquand) have been taken captive by the Oceansiders and are locked up after killing Natania. As they sit handcuffed, their fate is being debated. After the Oceansiders leave, Aaron assures Enid they’ll get out of there. Enid thinks Natania made it so she had to kill her, and she realizes she’d do it again because it was necessary. The Oceansiders return and the group and its leader have decided they’ll take Enid and Aaron to the beach. Enid warns them that if they executive her, her people will come looking for them. They will be wiped out. Enid argues that if they let them go, they’ll keep fighting the Saviors and the Oceansiders can stay hidden. Cyndie decides letting Enid and Aaron go will be their only contribution to the cause. She sets them free with the warning not to return. After Cyndie and her people leave, Aaron tells Enid to go to the car and head back. He reveals he’s going to stay there and try and convince them to fight. He also wants Enid to warn Maggie not to come to Oceanside. Enid makes Aaron promise she’ll see him again. They hug, well aware this could be their final time seeing each other. Aaron waits in the woods outside Oceanside. Simon leaves his meeting with Negan angry. He gathers his large, well-armed group to head to the landfill. There, he and his people confront Jadis, demanding an apology. She doesn’t give it. He reminds her Negan’s aware she had a side deal with Rick. Jadis finally lies and says she didn’t have a deal with Rick; she delivered Rick to Negan. Simon, furious, calls BS on that. He struggles to get himself back under to control to inform her Negan doesn’t want to punish them if they go back to the established deal. However, Simon and his people will take their guns and ammunition. Simon says they need the weapons, but the Scavengers don’t want to give them up. Simon assures the group that if they ever need guns, the Saviors will provide them. Jadis agrees. The Saviors disarm the Scavengers and then Simon finally asks the key question, “Why the dump?” Jadis calls it their place and Simon asks about the helicopter pad and solar panels. She continues to say it was just a dump before the apocalypse. Simon knows differently. Simon gives the order and the Scavengers are slaughtered, exactly the opposite of Negan’s orders. As they’re talking, Negan’s informed Rick is on the walkie talkie. 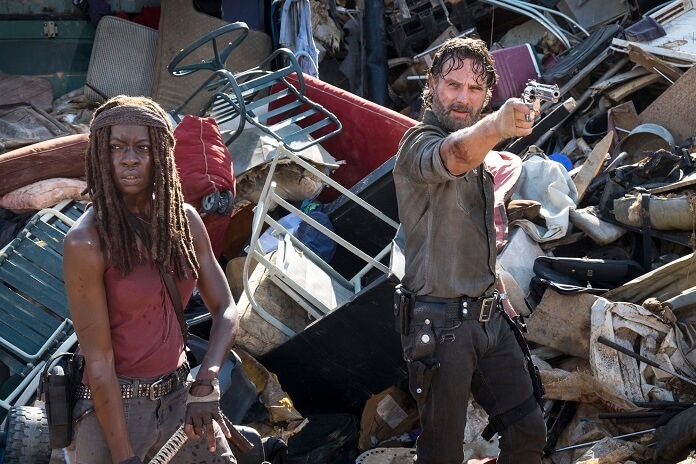 Rick and Michonne fight their way through the now-dead Scavengers but they’re outnumbered. They scramble up the garbage pile only to find Jadis still alive sitting on a mound of garbage. When they ask how to get out, she claims the only way is through the main entrance. She’s speaking normally (not with the weird cadence of the Scavengers) and recalls coming to this dump before the zombie apocalypse to find things to paint on. After the zombies, she thought they could create something new there. Her people did, becoming something different in every way. Rick and Michonne work their way through the walkers until they reach the blocked entry way. Jadis follows them begging to be allowed to get out. Rick shoots at her and soon her own zombie people head her way. Shortly thereafter, a blooded Jadis pounds the ground with a metal rod, bringing the walkers closer. When they arrive behind a chain, she starts up a grinder and they willingly walk into it as they try to reach her. She watches, nearly overcome with emotion, as her people are transformed into bloody mush. She watches her friends be torn to shreds while having flashbacks of their deaths at the hands of the Saviors. A little later she gets up from resting and uncovers a file cabinet. She retrieves a box labeled applesauce and eats from the can, lost in thought. Rick and Michonne leave the Scavengers and he admits he shot over Jadis’ head. He didn’t want to kill her. “I just wanted her gone,” said Rick. Michonne reveals it reminds her of what Carl was talking about – that they have a choice. Rick pulls over because he needs a second to collect himself. He thumbs through Carl’s letters, picks up a walkie talkie, and leaves the van. Rick unfolds Negan’s letter and reads it. He then reaches out to Negan via walkie talkie. Negan responds and asks if he wants a face-to-face. He lets Negan know Carl is dead and that he wrote a letter to him. Rick says the letters ask both he and Negan to stop fighting and for there to peace. “But it’s too late for that. Even if we wanted a deal now, it doesn’t matter. I’m gonna kill you,” says Rick. Negan wants to know how Carl died, asking if the grenades or the fire killed him. Rick says Carl went out to help someone and got bit. Negan, obviously upset, “God dammnit. Sh*t. I am sorry. You know, I wanted him to be part of things. I had plans. That kid was the future,” says Negan. Negan claims Carl is dead because Rick couldn’t leave things well enough alone. He puts Carl’s death squarely on Rick’s shoulders. He wasn’t there to stop his son from doing something stupid, blaming Rick for setting this course. Negan claims he is the answer; he stops people from dying. He asks Rick not to let his horrible decisions cause the deaths of more of his people. Negan feels horrible about Carl’s death, but thinks Rick failed as a leader and a father. He tells him to give up because he’s already lost.